we are re-watching cheers gradually. a show that she watched somewhat as it aired (myself i only saw the final episode -- and as a momentous occasion really rather than a televised story, having none of the context of what had gone before), and which we both had watched after it aired (but before we met). so for the first time together. last night while rewatching the excellent episode featuring the ever effervescent carol kane, a ditch in time, my eagle eyes spotted something. written in chalk on the small chalkboard scoreboard hung in the back room near the pool table was something i never expected to see in a boston bar: "GO TIGERS!". i looked up the airdate, and sure enough the episode coincided with the tigers' world series championship of 1984. although the episode aired on december 20, 1984, this would mean that it had been filmed several weeks before, during the run of october baseball playoffs when the tigers' fate had yet to be revealed. 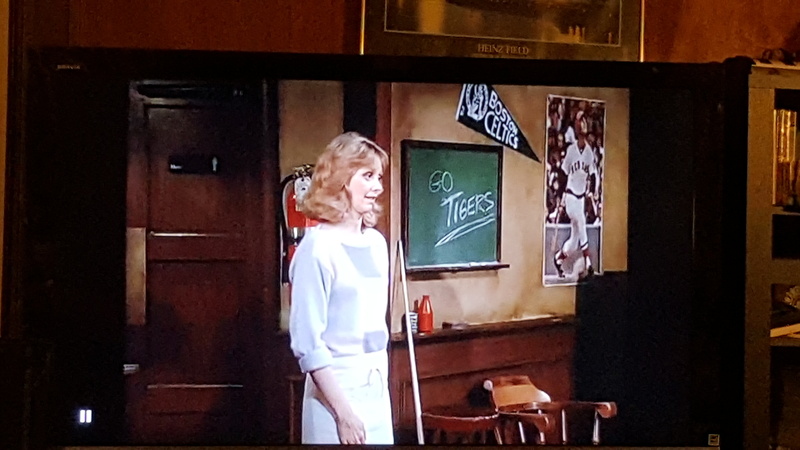 i have found no anecdotal evidence but surely some well-meaning actor or member of the crew who was a tigers fan had surreptiously altered the chalkboard, knowing that it would appear in the background of the episode. what chutzpah to place it in a shrine to the red sox owned by a former red sox player! although the viewing public didnt see the episode until after the world series ended (as opposed to the live studio audience), which is a bit of a shame, it feels so very good to learn that boston (in a way) and cheers played a small part in helping to bring us a world championship. so good, so good, so good! Amazing. 1984 is the first baseball playoffs I can remember. By 1985, I was a full on baseball fanatic and recall all of the playoffs from 85 on pretty clearly but 1984 and the Cubs and Padres and Tigers stadium is a mix of vivid fragments.